Hello, March! I'm not entirely sure if I'm happy to see you so soon, but you will be filled with lovely things! This month the story that you'll be seeing pop up a few times is The 12 Dancing Princesses. I LOVED this story when I was younger, so I'm really looking forward to working with it, and wait until you see the puppets that I have planned! Actually, the illustration here might give you a bit of a hint. Sort of. 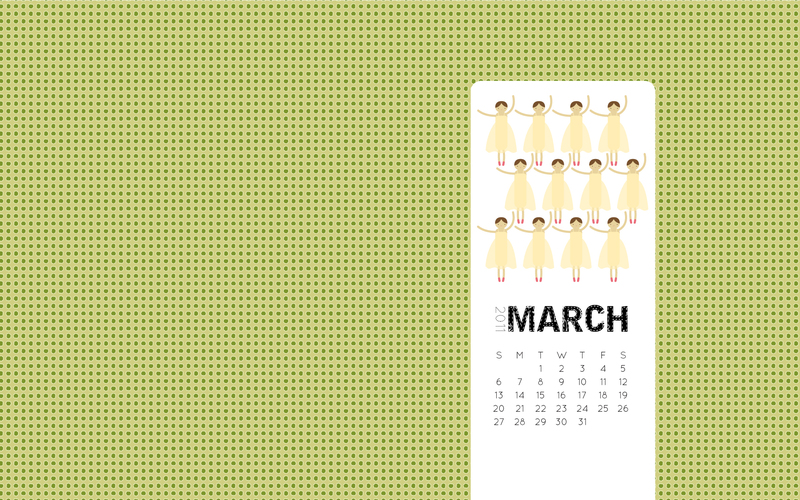 The 12 Dancing Princesses got all dressed up each night, and your computer desktop can look pretty too. Download the PNG file or the JPG file (much larger file size), and when you make it your wallpaper, just be sure to set it to fill the screen. And while I'm welcoming March, I'd like to welcome a bunch of new March sponsors! We'll more from them along the way, but for now you'll want check out these wonderful blogs. Aww, that's lovely! But for some reason I can't put the PNG file up as a desktop wallpaper... Do you know a way I can fix this? Thank you!!! Thanks, Fiona! I just added a JPG version too. Hopefully that will work better for you! oh mollie, this is gia's favorite story right now. this will be such a lovely treat for us! Thanks! It is so cute! It's lovely, thank you so much! Just downloaded it! Thanks much!